Illustration is that of an ideal Kigoi. 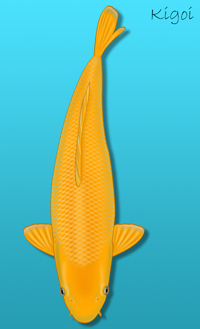 The Kigoi is a single colored non-metallic yellow koi. It is also a very friendly variety. Look for clean and consistent color. When Kigoi have red eyes instead of the standard black eyes it is called Akame Kigoi. The Akame Kigoi is quite rare. Kigoi are in the Kawarigoi classification.